What we enjoy most about the cabin is relaxing on the 60 ft deck that over looks the pond at the end of a wonderful day ! We take time to reflect on the nature hiking trails we explored & the wildlife we encountered on our adventures walks during the day .But what keeps us coming back to the cabin is the beautiful views surrounding the property just a reminder of our creator in all his majesty. With the option to catch dinner in town (Ellicottville) or just hang out and enjoy a B Q we never tire of the fresh air and plenty of sunshine as we enjoy a late dinner setting on the deck once again. Time seems to stand still at the Lodge as wonderful memories are made memories that last a life time Some of our guests have retuned for there 15 year and are now bring back 2nd generation of family with them. The Lodge Truely a place to relax and enjoy family & friends come stay a while and see what we mean- you're always welcome. We choose this location because it reflects the beautiful landscapes offered to hiking & biking ,trail rides,wildlife photography,and peace of mind just relax and enjoy ! What a lovely time we had! House is perfect for big and loud family gatherings! We all loved the big fireplace and burnt a lot of wood that was provided for free! Thank you Margie! Our little ones 3,5 and 7 felt very comfortable and adventurous running around playing hide and seek! And the adults survived 5 days without internet, in fact all enjoyed the “no cellphone” time... it meant more talks and more games!! Ride to the ski hills takes 15 min, no problem! 3 generations of our family stayed this year. The property is great to let the kids explore and play outside and plenty of room inside when the weather doesn't cooperate. We were able to get all 12 family members around the kitchen table. We enjoyed cooking in the kitchen. The 2 bathrooms with showers made everything easier. Our only negative is the configuration of the bedrooms; they didn't fit our needs. We enjoyed swimming and fishing in the pond and I could have sat on the porch all morning. We took a side trip to Griffis Sculpture park this year. The scenery was spectacular. Our youngest family member was fascinated by all the animals hanging on the wall. The Lodge is the best! Great place to get away and unplug! Happy you enjoyed your stay ! I have stayed at Alpine Wilderness Lodge many times over the last 10 years or so! Alpine Wilderness Lodge has a cozy, homey feel to it and is a great place to gather with family and friends. It offers lots of comfortable sleeping arrangements and a nice size kitchen to cook and hang out in. 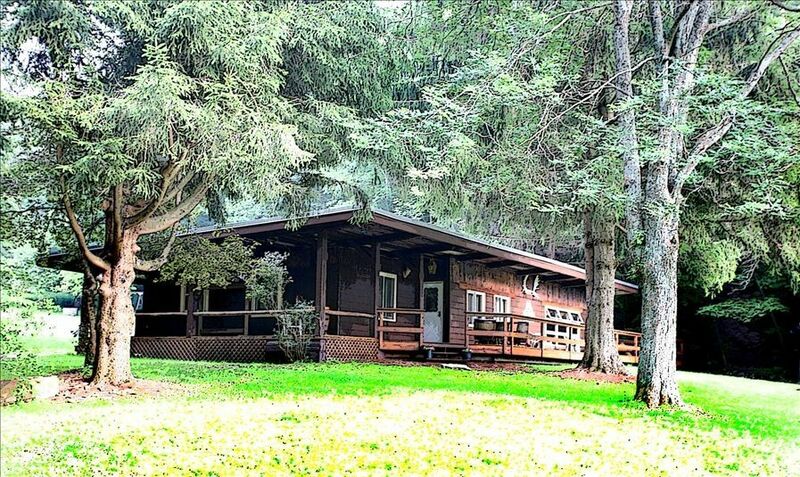 It is in close enough proximity to Ellicottville, NY to ski, shop, eat and enjoy the nightlife, but far enough away where you get that wilderness, zen feel. There is a huge pond to fish in, and lots of land to enjoy your outdoor hobbies on. Also, the owners are amazing and very attentive to their guests!